today i get to welcome one of my lovely & super talented bloggy pals - maggie of "smashed peas and carrots". i luv mags. she's so sweet, funny, can cook up a storm (this girl loves her some crock pot!) and is oh so crafty! 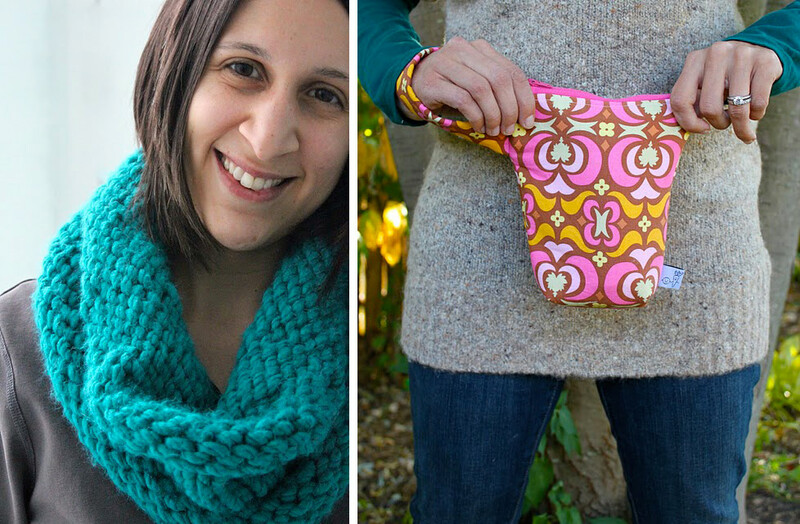 sewing, knitting, crafts, baking - you name it, maggie does it right along with blogging, her etsy shop and 3 kids! wowsa! Funny thing is this skirt is really a take on yoga pants but with some flair! Basically, the waist band is very wide and can be folded down or kept up (just like many yoga pants) depending on how you like to wear your skirts...or what top you are wearing with it! It also doubles as a great maternity skirt because of that stretchy wide waistband...I lived in skirts like these at the end of my last pregnancy while I was sweltering in all the summer heat...so if you are pregnant keep on reading!! 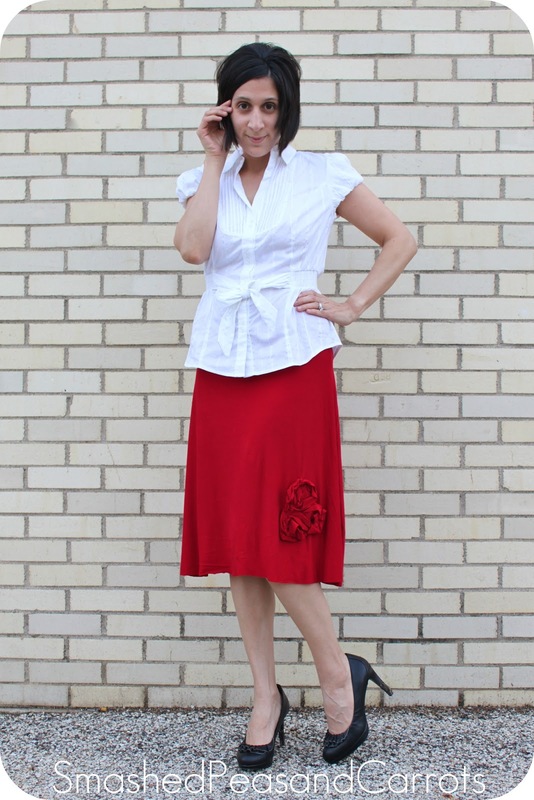 This skirt is made of super soft jersey knit yardage. It has a very lightweight and bouncy feel and the cut of the skirt gives it some very lovely drape making it oh-so flattering to wear. Well are you ready? Then let's get started! First, to get the measurement for your hip band and top of your skirt you are going to take your jersey knit yardage and stretch it around your waist so it's nice and snug. Jersey knit tends to stretch a lot so make sure you are pulling it taught enough so that it will stay up on your hips. This measurement will become 'X'. To figure out your skirt's hip measurement you will take 'X' and divide it by 2 (since you are cutting on the fold) and then add 1 for your seam allowance. The length of the skirt can be whatever you feel is a comfortable length for you. As this skirt is more dressy than casual I made my skirt length 21 inches since I wanted it to fall slightly below my knees, but really do as you wish here. Also note that my skirt bottom is not hemmed. If you are hemming take this into account in your length measurement!! 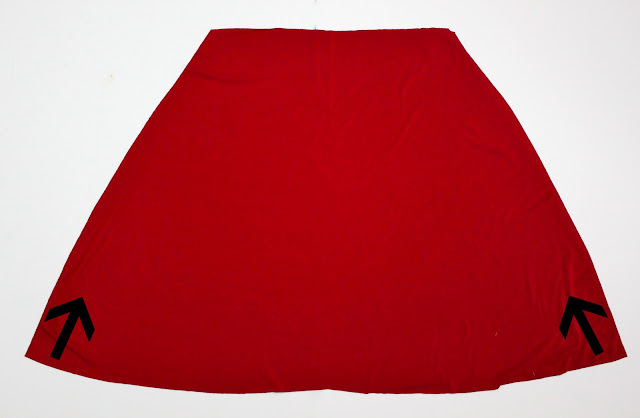 The width will be 17 inches and you can see from the picture above how there is a slight upward curve in the cut, this gives the skirt the flouncy drape. Then, just connect the dots for the remaining edge. 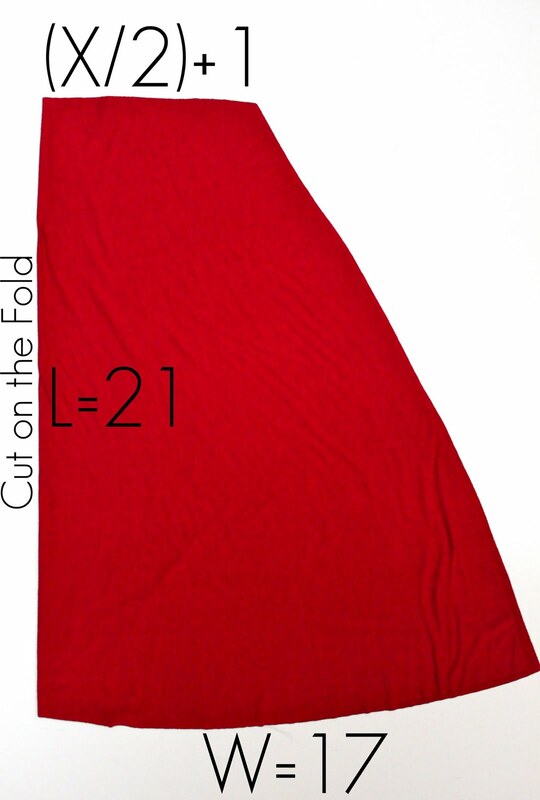 Please remember to cut this on the fold of the length measurement as seen in the picture above as well as to cut two, one for the front and one for the back of your skirt!! 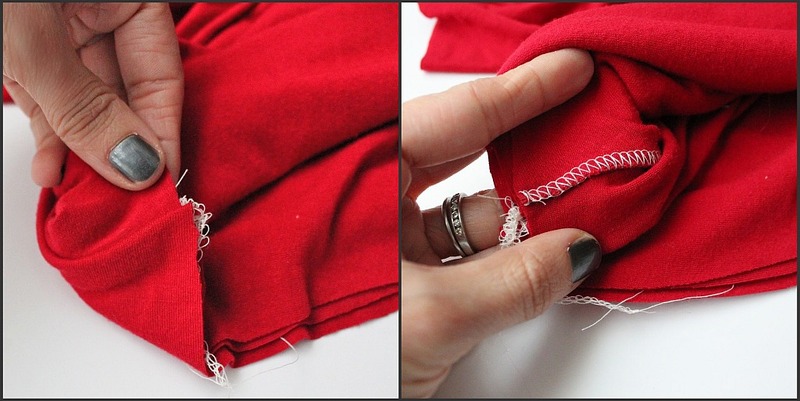 Once you have your two (front and back) skirt pieces cut, sew up both sides. 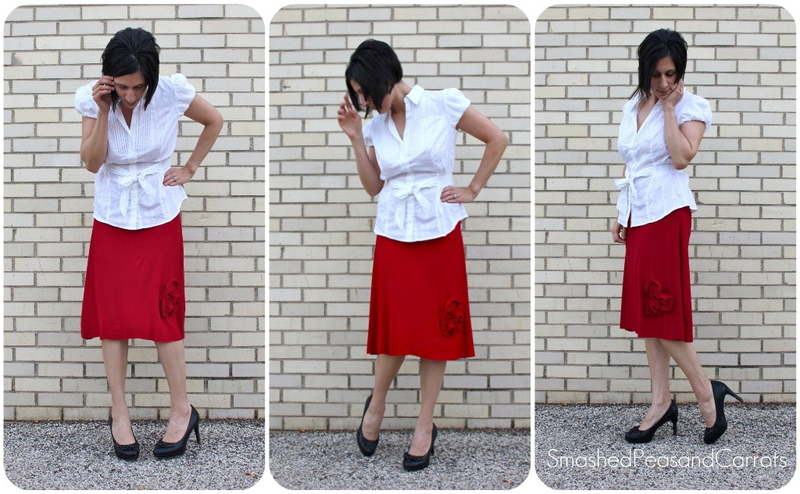 Turn the skirt right-side out and set aside. To make the waistband, once again take your measurement 'X' and divide by 2. Then add 1 inch for a seam allowance. The width will be 14 (if you'd like a band you can fold over). Cut two pieces for the front and back of the waistband. Sew or serge both 14 inch edges together to make a tube. Next fold the waistband over so that the sewn seam is in the inside and the width is now 7 inches. Place the folded waist band around the outside of the skirt with the folded edge toward the bottom and the raw edge at the top. Aligning the waistband's raw edge with the top of the skirt's raw edge. Here's a peek at what that should look like. 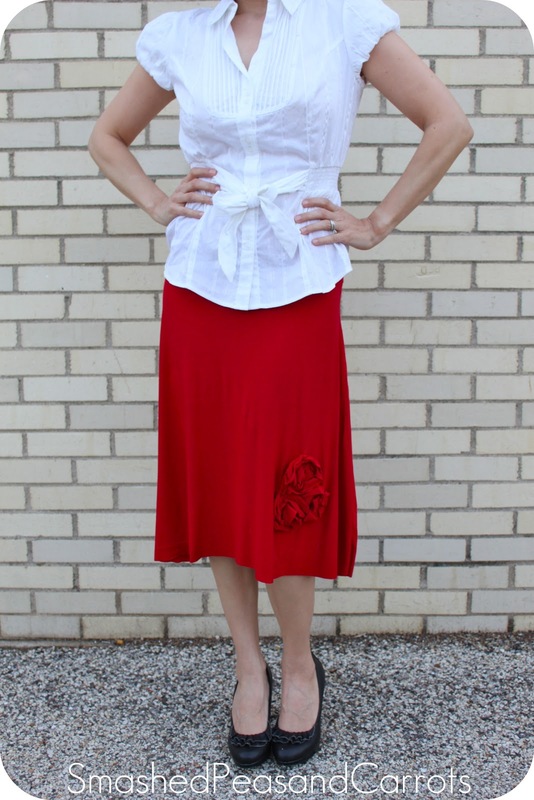 Left picture shows the outermost side of the waistband and the right picture shows the innermost side of the skirt. Once your raw edges at the top are aligned, sew completely around the top of the skirt making sure to match both side seams together for a nice finished look. The waistband is now attached to the skirt. Flip the waistband up and 'Hooray!' your skirt is done!! Now it's time to make some roses!!! 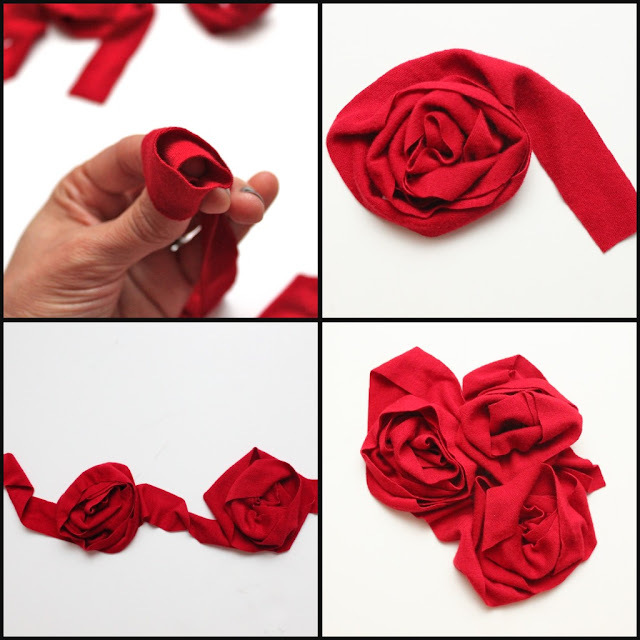 Grab your leftover knit scraps and cut 1 and 2 inch wide lengths of knit to make rolled jersey roses. Start rolling the knit around two fingers until you get a size you are happy with for your skirt, mine are about 3 inches in diameter. I added the bottom two pictures (above) to show you different ways you could design your roses. I think the bottom left design would look awesome going along the whole hem of the skirt, how cool would that be! I ended up doing three roses bunched together like a bouquet...it just suited me! 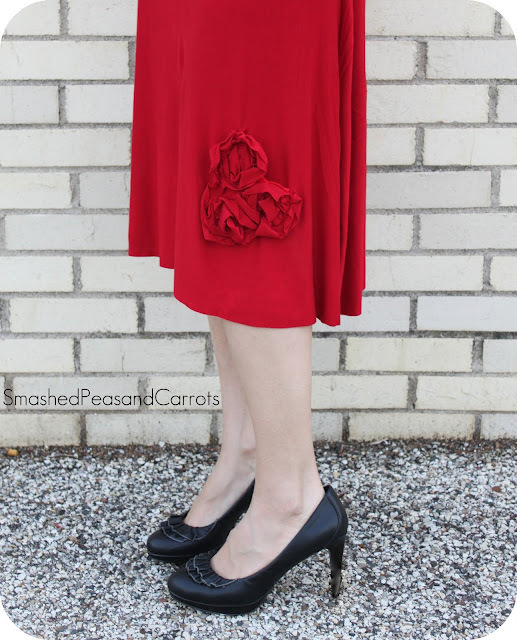 Now you could sew your roses directly onto your skirt but what I did was sew them onto a small piece of felt and then hand sewed the felt onto the skirt. Do whatever is easiest for you...I won't mind a bit! And that's it!! 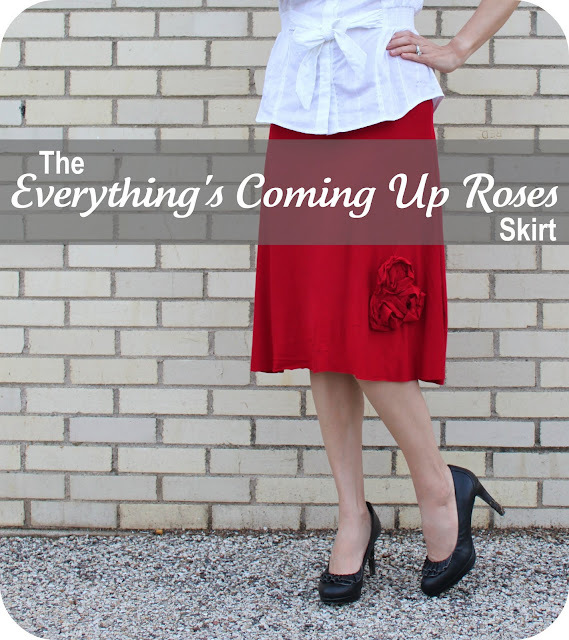 You have just made yourself a pretty and very feminine skirt for a night out on the town. Thanks for having me Shannon! Go Comfy Sews!! what do you guys think? fab right? wouldn't this be equally as fab with a cute tank and flip flops for the beach? 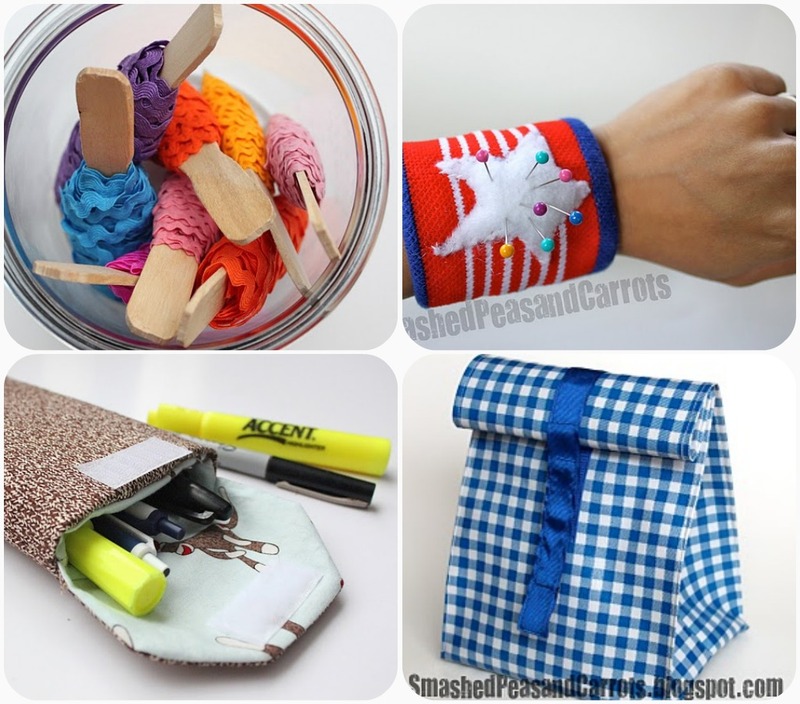 so many options and so easy to make! how would you style it? You are too sweet Shannon!! Thank you so much for having me today!! Awesome tutorial. 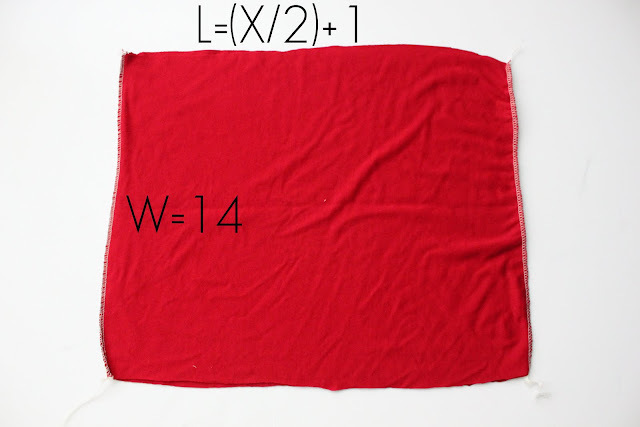 One question: In the photo for cutting the front/back on the fold, shouldn't the top measurement be (x/4)+1 rather than x/2 ? ?